Slurry spreading contractors are increasingly adopting technology to measure and record the nutrient value of applications. A new analysis system from John Deere could refine this further to give a precise calculation of slurry’s value as part of an overall fertliser regime. Jane Carley reports. John Deere visual showing how yield maps from maize can help to plan slurry applications which are then controlled via the Manure Sensor to apply target amounts of nutrients, the sensor analysing slurry content close to the point of applications. As-applied data can then be used to calculate the remaining nutrients required in the form of mineral fertiliser. John Deere’s new Manure Sensing system could help contractors offer a site specific slurry application service where the nutrients in slurry are precisely measured as applied, it claims, and the flow controlled to deliver a target or limited amount of slurry. Slurry applications can be calculated as part of the crop’s total nutrient plan, offering savings on mineral fertiliser. Applying slurry with increased precision could also help farmers in NVZs and catchment areas ensure that they comply with legislation, while providing an accurate record of the amounts applied. Jointly developed with Kotte Landtechnik, Fliegl Agrartechnik and Vervaet BV, Manure Sensing uses NIR (near infrared) technology to work out site-specific nutrient application rates. John Deere has been using similar technology for several years on its Harvest Lab system fitted to the spout of its self propelled forage harvesters, which provide yield and constituent analysis of forage crops as they are harvested. Based on complementary data from yield mapping, soil sampling, N-sensors, etc., the required application rate (target rate and/or limit rate) can be set in Deere’s GreenStar 2630 cab display prior to application. The NIR sensor measures key ingredients of the slurry (dry matter, total nitrogen, NH4, P2O5 and K2O) in real time. The system then adjusts the final slurry flow to deliver the desired quantity of nutrients required. As measurements are taken on-the-go and close to the applicator, the variable nature of the nutrients in liquid manure can be taken into account. Ingredients can be applied based on a target rate for one nutrient (e.g. nitrogen) and a maximum rate for a second ingredient (e.g. phosphate). Application rate per square metre can also be controlled with a combination of tractor speed automation, if used with a compatible tractor, and flow rate control. This ensures a rapid reaction to changing operating conditions and a wider adjustable range, without affecting the distribution quality across the application width, says John Deere. Having measured and documented the ingredient application of N-P-K, the contractor can process an application map for an individual field and provide the data to the customer via the internet based Operations Center in MyJohnDeere.com. This provides the facility to use data from harvest and organic manure applications to help with fertilizer planning. Customers can then use the nutrient maps to calculate site-specific amounts of mineral fertiliser needed to achieve nutrient target levels. 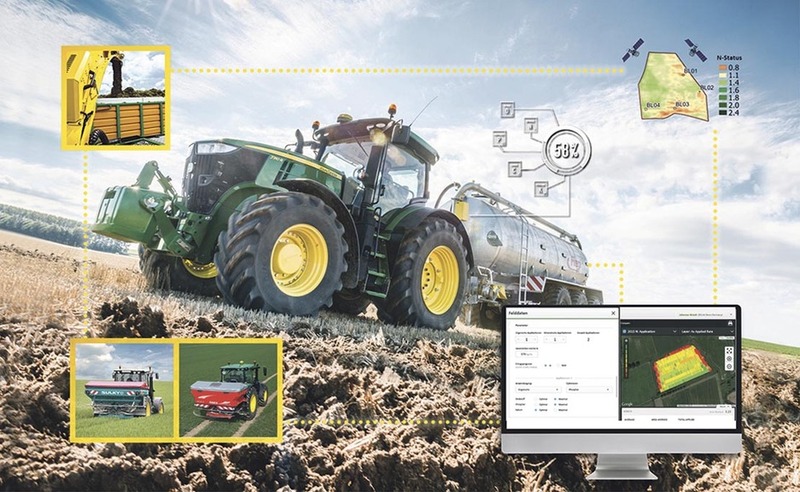 Deere also plans to add a tool that will enable customers to turn the data directly into a prescription map that can be sent wirelessly to a tractor for implementation. Customers may also create prescription maps with their own farm management software or potentially use a FarmSight dealer service to assist with overall nutrient management. The system, due to be formally launched to UK customers at Lamma as part of the FarmSight precision farming package, is still in the final stages of development. Specialist slurry contractor and equipment supplier Tramspread has been trialling the Manure Sensor from its base in Mendlesham, Suffolk. 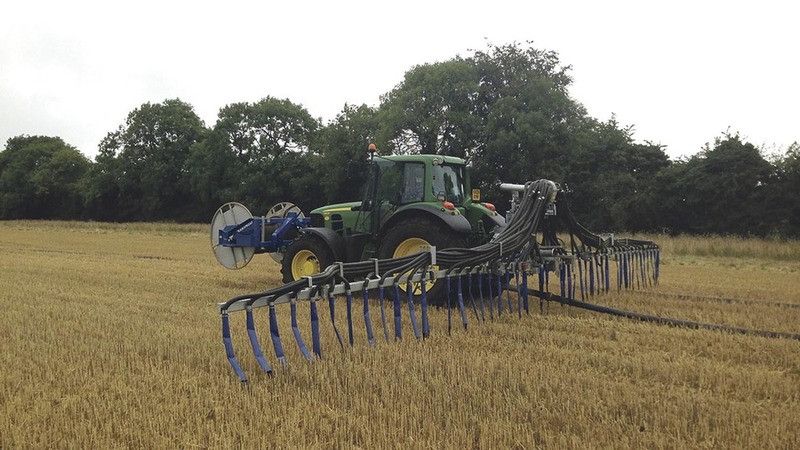 Tramspread’s contracting arm has been using Deere’s GreenStar to map applications for several years, and Mr Baker says that some forward-thinking arable clients use the data to help plan fertiliser programmes. He suggests that operators of AD plants in particular view the nutrients in digestate as an important part of the package, testing the material to get an accurate idea of its content. While the commercial development of the Manure Sensor has mainly focused on tanker systems, Mr Baker points out that the continuity of flow offered by an umbilical system offers greater accuracy. Mr Baker concedes that for a contractor, justifying the cost of the equipment is reliant on being able to convince the customer that the increased accuracy and traceability is worth paying a premium for.